Many people don't see the point in purchasing holiday dinnerware; after all, you only use it once a year. The same goes with china in general for most families. However, "fancy" dishes really can make an impression and make it a memorable event, or even a family tradition. 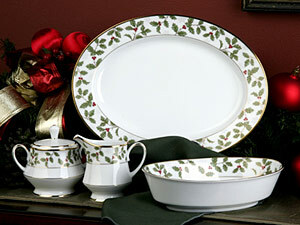 Christmas dishes,Valentine Dinnerware and other holiday dinnerware make everything special. You can always store your dishes with your holiday decorations rather than keeping them in your cupboards all year. I have a toolbox type chest that I store my china and glassware in to protect it in storage. Wrap it in bubble wrap and it is good to go to the storage room. Do you have a favorite holiday story to tell? One of my greatest memories of my childhood is visiting my grandparents' house on Thanksgiving Day. Most of the family gathered every year and we had a lot of fun together. Sometimes dinner was served on china, but the turkey salt and pepper shakers were always present. Now, I use the turkey salt and pepper shakers at my house every Thanksgiving and Christmas. They are a family heirloom that I am happy to have. I don't usually serve dinner for the holidays at my house because we always gather at my parents' home, so presently I don't have or need holiday dinnerware, but I do display my Christmas tea set around Christmas. One of these days my sister and I will start serving holiday dinners and I intend to accumulate holiday dinnerware before then. I'm thinking about getting some casual snowman dinnerware to use during the winter. It doesn't snow much in southern New Mexico, so I think it will add a touch of wintertime to our surroundings. 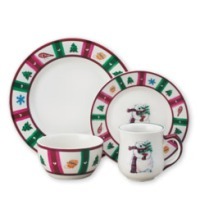 I absolutely love Christmas dinnerware with holly, candy canes, or big red bows in the pattern. Choosing one will be a difficult task for me because I love them all. 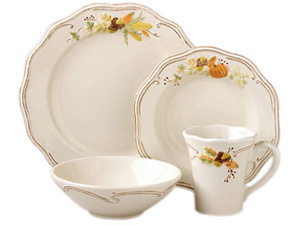 For Thanksgiving dinnerware. I think solid fall colors would be appropriate mixed with a centerpiece and placemats; however, the Thanksgiving patterns are nice too. My dilemma is that the dinnerware has to go with my turkey salt and pepper shakers! Spring patterns are perfect for Easter dinnerware. If you want to your holiday celebrations to be memorable, holiday dishes can help to create a special time for your friends and family. They also make great heirlooms that you can pass on to your kids or grandkids.